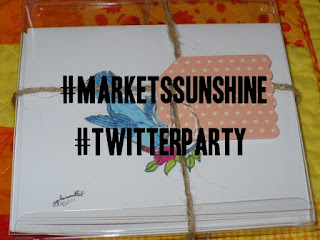 To be eligible to win our buy one get one free gift club subscription offer you must be a registered user of Twitter, follow #MarketsSunshine on Twitter, sign-up for our newsletter, RSVP in the comments below with your Twitter handle @handle and reside in the USA with a USA mailing address in order to win any of the prizes. When you come to the party you must use the hashtag #mosgiftclub in each comment and to answer to questions. You must retweet the party and all questions. We will be giving away one gift club subscription when you buy one according to how many RSVP's we receive for this event, with a limit of 4 per event. You can only win one prize per event. To claim the prize you must sent us your full name and home mailing address after the event via email. We will email all winners instructions on how to claim your prize within 24 hours after the event. You must respond within 3 days to claim your prize. You must be 18 years of age or older to play and reside in the USA. 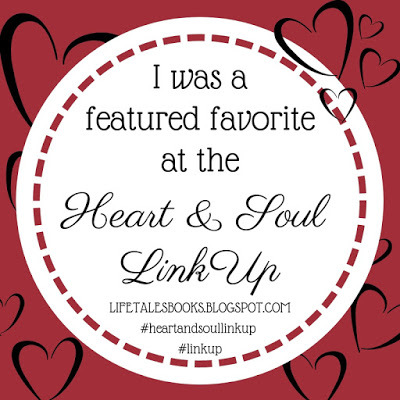 Leave a comment on this post or on the newsletter page with your RSVP twitter handle@. #marketsofsunshine #handmade A lovely array of items from the MOS team. 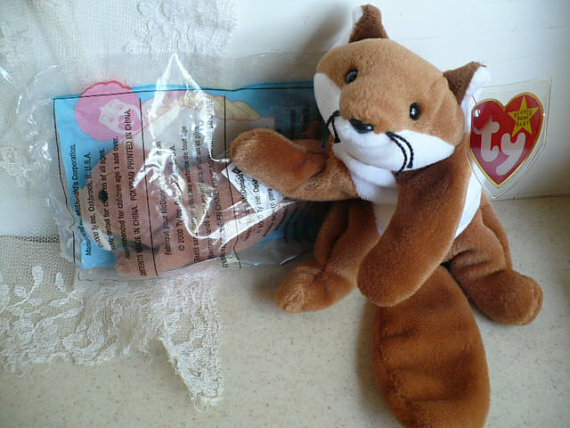 Take a look at these talented Etsy sellers and some of their items. 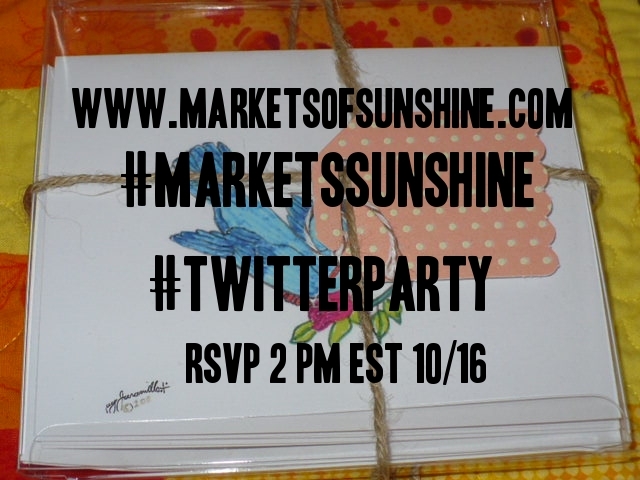 Markets of Sunshine will be hosting weekly party on Twitter and Facebook every Friday at 2 p.m. est. What is a Twitter Party? It's a fun way to win prizes by playing Q & A games. The questions are easy and based on life style likes and dislikes, habits you do around your house and in every day life. Facebook parties are hosted much in the same way but held on Facebook. How do you play the game? 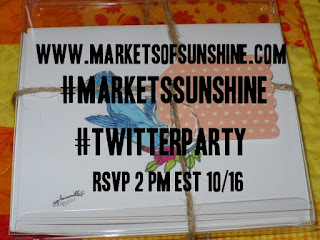 First, you RSVP the day of the party here on Markets of Sunshine by typing RSVP Twitter Party or RSVP Facebook Party in the comments box below. Next, you sign up for our newsletter if you are not already subscribed. Click this link to subscribe. Then show up on Friday at 2 p.m. at the designated location that we will announce here each week. 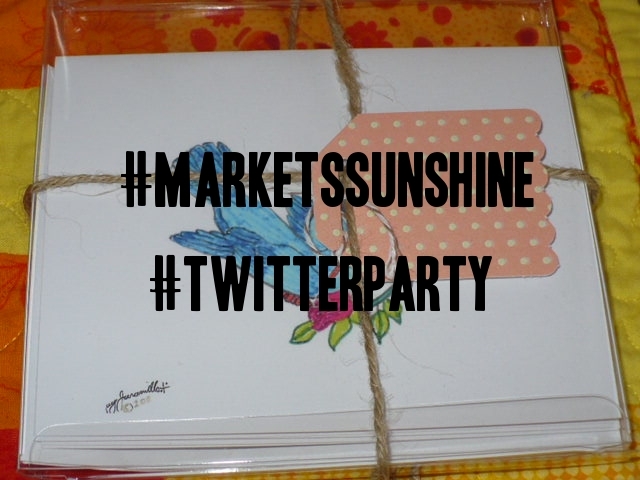 Once, you have subscribed and RSVP'd in the comments box, then head over to Twitter type in #MarketsSunshine and come to the party! You have to be a newsletter subscriber, RSVP'd and use hashtags in your answers to get in drawings to win prizes! ***This week will be giving away 3 Gift Certificates for $10 off any of our Gift Club subscriptions and 1 grand prize of 1 Gift Club subscription of your choice for one month to try it out before you sign-up for more. Remember, you have to RSVP in the comments below and sign-up for our newsletter to win prizes. Roscon a Colombian pastry made with guava paste. Pour 4 tablespoons of warm water into a small mixing bowl. Add 1/2 of the sugar and yeast, and stir to dissolve. In a large mixing bowl add the flour, salt, remaining sugar and the water and yeast mixture and begin mixing. Add the butter, vanilla and eggs. Mix well. Turn the dough out onto a lightly floured work surface and knead for 30 seconds. Cover with a towel and let rest for 10 minutes. Punch the dough down and divide into 2 equal size pieces. Shape each piece into a smooth long rope. Then, using a rolling pin, roll each piece of dough into a long rectangle. 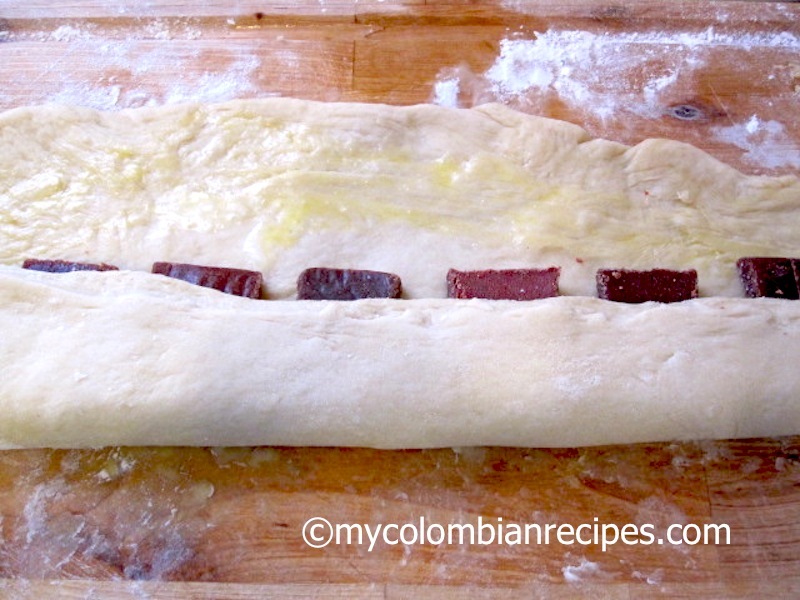 Place the guava paste in the middle of each rectangle and roll the dough up jelly-roll style. Connect the two ends together, forming a ring. (dip your finger in water to seal the two sections together) Repeat the process with the other rectangle. Place the rings, seam side down, on a baking sheet lined with parchment paper,(or oiled) Cover and let rise in a warm place for 20-30 minutes. Using a pair of scissors or sharp point of knife, make cuts in the dough at 1 1/2″ intervals around the outside edge. Preheat the oven to 400˚ F. Brush the tops of the rings with the beaten egg white and melted butter. Bake for 15-20 minutes, or until the tops are golden brown and the rings are baked through. Sprinkle with sugar on top and let them cool 15 minutes before serving. Store leftovers in sealed container in fridge. Promoting Markets of Sunshine Etsy Team Vendors, Click here to browse our shops! Gift Club Preview! Early subscribers get 20% off their first month's subscription! Finding a great gift for kids is not easy. Bright colors are the best gifts to give kid's because they excite the senses! Notice how these gifts below grab your attention the moment you see them. That is what you want when you give a child a gift. Click on any picture and go to that shop to make your purchase. A Multicolored Medley: Featuring lovely multicolored items for sale by members of Etsy's JW Buying Club, Boutique Promotion & Networking Team. Sign-up for our newsletter to receive coupon codes from our vendors shops. Click here! You'll receive your coupon code in your first issue to your inbox. Be sure to open it to grab your discount.